Many of you may have trouble accessing SIMBunch.com the past few days. First, please let me extend my sincerest apologies. If there were any inconveniences, I can only hope that you will forgive me. I have had the worst experience with my current VPS provider that I'm bordering on tearing my hair out right now. It is just a complete wreck that I cannot even begin to describe. My current provider has totally failed their 99.9% uptime guarantee, and has one of the most nightmarish support ever. It's like they have hamsters manning the support desk, and none of them speaks English. It started last week when I was in Cuba, half the world away with less than dismal internet access, and basically freaking out. The httpd process was dropping once every 5-10 minutes, and sometimes required a complete server reboot to get it restarted again. The only person that responded told me this is expected of a VPS (which is, of course, bullsh*t). I came back and the same crap started happening again. They claim they have sent out notification emails about the situation, but of course I have received none. So, enough is enough. It is now 6 in the morning. I am still terribly jet-lagged, haven't slept a wink in 22 hours (because they "missed out" including Zend in their latest recompilation, after installing a firewall which I assumed was there all along! ), and feeling totally like sh*t right now. I've cleared about a dozen tickets prior to the latest downtime, and I will finish the rest by the weekend. That's a promise. In the meantime, if someone has a good VPS to recommend, please feel free to let me know. I'm looking for good connection between Asia, US and Europe, quick response for emergencies, with WHM/CP. Much appreciated. Very good support, good prices, they use WHM/CP and it's updated at all times. We experience downtime when you servers were down too. 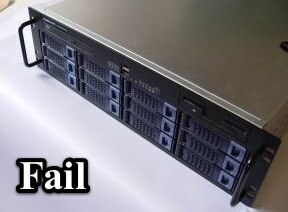 We have hardware and VPS servers that are a great solution. I'll let you try out our service for 30 days no cost and we can show you the difference in our service vs the other guys. I will even give you my private cell phone in case you have ANY issues. If it helps any, although the uptime promise should be kept by the VPS provider, please know that your users (as least this one) truly understands and will be patient. Truly do appreciate your being able to offer the continued tech support even while try to cope with the server nightmare. Thanks for the suggestion Constantinos. I'm pretty comfortable with HostIcan's services (they are responsive and service has been pretty good, but they don't tend to notify when there is trouble on the line), so I am definitely always on the look out for something better. Hope you find a good solution, Mike. Avoid 1and1 at all costs... They caused me to loose 20+ customers over a 5 day cluster fk which was there fault. Would not know who to recommend to be honest but keep up the good work.